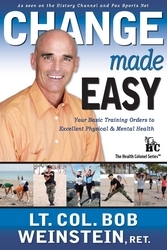 Lt. Col. Bob Weinstein takes his successful fitness beach boot camp programs on Fort Lauderdale Beach, Florida and shares them in his new book, Change Made Easy - Your Basic Training Orders to Excellent Physical and Mental Health, published by Advantage Books in Orlando, Florida. His book is a guide to values-based group exercise and healthy living without all the hype and product promotions. It is designed for corporate wellness programs, youth programs, health and fitness professionals and people who have always or never exercised. It's time to declare war on the state of health in America. My fitness boot camp programs are designed for all fitness levels. They are easy to implement, focus on a positive workout atmosphere and promote an excellent support system for achieving all fitness and weight loss goals. "It's time to declare war on the state of health in America. My fitness boot camp programs are designed for all fitness levels. They are easy to implement, focus on a positive workout atmosphere and promote an excellent support system for achieving all fitness and weight loss goals." Col. Weinstein's book is available in the United States, Canada, Europe and Asia. His book, Change Made Easy - Your Basic Training Orders to Excellent Physical and Mental Health, can be ordered as paperback through AdvBooks.com, Amazon.com, Amazon.ca, Amazon.co.uk, Amazon.fr, Amazon.de, Amazon.co.jp, Amazon.cn and BarnesandNoble.com. Lt. Col. Bob Weinstein, nationally known as The Health Colonel, was born in Washington, D.C., grew up in Virginia and spent 20 years in Berlin, Germany. His first name is Joseph and has always been called Bob. He is retired from the Army Reserve as a Lieutenant Colonel with 30 years of service and spent about half of that time as a military instructor with the Command & General Staff College.